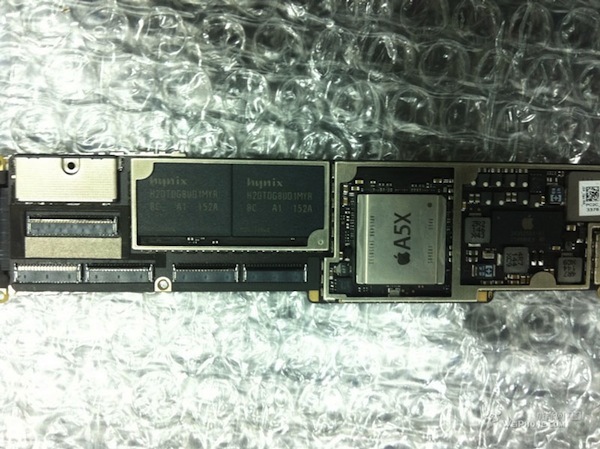 An image of the next generation iPad’s logic board has surfaced and the chipset pictured is not the A6 processor many assumed to power the iPad 3. The leaked image shows an A5X chip distinguishable from the purported A6 chip. If the picture is indicative of the actual production iPad 3, the incoming Apple slate will be powered by a modified iteration of the A5 processor found in the iPad 2. The logic board indicates the chip was manufactured in November of last year. The pictured board has 16GB of flash memory courtesy of Hynix. Rumors earlier this month claimed Apple was planning a quad-core A6 processor capable of high end graphics. The latest leak says otherwise. Then again, this is all speculation. Apple is expected to respond to all of the rumors early next month.